Dynamic website for BSCIC | Business Automation Ltd.
Bangladesh Small & Cottage Industries Corporation (BSCIC) is a corporate body, and it Provides services to the private sector entrepreneurs in creation of new capacity and maximization of existing capacity through its 4 divisional and 64 district offices. Besides, BSCIC also providing services to the private sector entrepreneur, artisans, unemployed youths through its Design Center and Small and Cottage Industries Training Institute (SCITI). To improve the overall efficiency, BSCIC has received assistance from World Bank under the EGBMP (Enterprise Growth and Bank Modernization) project for its capacity building through implementing the Technical Assistance (TA) project, BSCIC (ISBBPB). This ISBBPB project is one of component of EGBMP project and has implemented the Website Project under overall supervision of Prime Minister’s Office. As par of the above, BSCIC has taken this project for the development and implementation of interactive website to provide better services to the private sector small and cottage industries partner and stack holder by disseminating the required information and providing other web based services. Business Automation Ltd has awarded as a consultant for the required services as per their RFP.Â Accordingly Business Automation Ltd. has successfully designed, developed and implemented the Website and conducted Training session for the targeted User as per requirements with good reputation. Now the Interactive website is running with real life data. The URL is : http://www.bscic.gov.bd so, that the user and visitorâ€™s can visit the website and can get required information as per their requirements. The website provides a brief information about BSCIC, its services and activities, Citizen charter, Design Center and SCITI as well as brief on different development and technical project, future programme and others. 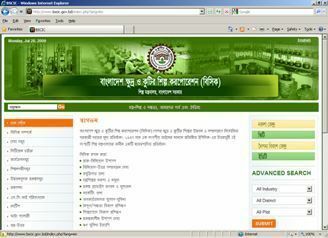 The general informations are basically text based both in Bengali and English language.